← Houston, we don’t have a problem! The Chinese are going to start building computers in North Carolina. Not actual Chinese nationals mind you. Rather Lenovo, a Chinese computer company, is going to start manufacturing computers in North Carolina. Lenovo’s “operational” headquarters is located in Morrisville, North Carolina. Lenovo, you may remember, bought IBM’s personal computer business in 2005. Lenovo recently became the world’s largest computer seller, just barely edging out HP. Lenovo will be producing a few 100,000 computers in North Carolina with a few hundred American workers. Like most computers, members of our extended American family in North Carolina will assemble Lenovo computers from computer components that are made all over the world. So, what do you think? I have no problem buying a Honda made here; in fact we own two Hondas Made in the U.S. But I must say, I feel a bit different about the Chinese. Am I being bullheaded? Does it matter at all who owns the firm (Chinese, Martians, Canadians) as long as the firm hires members of our extended American family to make their products? I would really like your take on this issue. Please leave a comment. As I told you in an earlier post, there already are some U.S. assembled computers. But now there will be more choices. Anyway, chime in on this Lenovo development and tell me what you think. This entry was posted in Uncategorized and tagged American computers, IBM, Lenovo, Made in America, Made in the USA, North Carolina, U.S. made computers, United States. Bookmark the permalink. 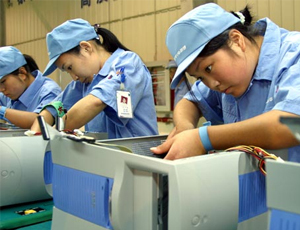 I think it is just fine that a Chinese company comes to the United States and hires American workers. All the downsides are gone such as Slave Labor, monetary manipulation, government subsidies and trade deficits. It should be no different that the hundreds of multi-national corporations we already patronize. -Jack A.